I have always been in awe of Olympic athletes. I deeply admire their dedication, determination and drive. While in Mexico in December, I met my first Olympian – Muffy Davis who has won seven Olympic medals. We met when our kids started playing together at the pool. Within five minutes of talking to Muffy Davis, I knew she was someone special. She inspired me beyond belief and taught me lessons about life, and of course leadership, that I will never forget. But before I share the ways in which Muffy inspired me, I’d like to tell you her inspiring story. Muffy started skiing when she was three years old. By age seven she was already dreaming of Olympic gold. At age sixteen she was poised to be part of the US National Ski Team. But one morning, while training, Muffy had a freak skiing accident that left her paralyzed from the chest down. After her accident, Muffy felt lost. She couldn’t imagine a fulfilling life in a wheel chair and wanted to die. But over time she realized that her initial fears were unfounded. She realized that change is extremely difficult but it doesn’t have to be something altogether negative. So, Muffy made a decision to “SurThrive”. And SurThrive she has. While in a wheelchair she has accomplished many things that most of us just dream of doing. She has climbed mountains, been deep-sea diving, rolled across the Great Wall of China, ridden on elephants in Thailand as well as graduating from Stanford University. In 1998 she started competing in skiing at the Paralympics. 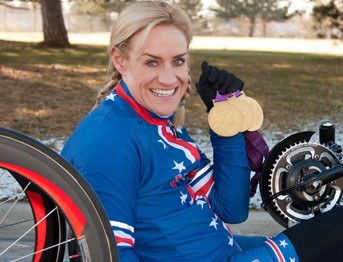 In London in 2012 she achieved her dream of winning gold three times over for Handcycling. Muffy’s amazing courage and determination has moved me in so many ways. I’d like to share with you the top two ways she has inspired me both in leadership and in life. 1. Perseverance: Despite difficulty or delay in achieving success, don’t give up. Keep focused on your goals and don’t let any obstacles or challenges dissuade you from moving forward. 2. Positive Mindset: Against all odds we can all achieve whatever we believe is possible. Your life may turn out differently than what you expected but with a positive mindset and winning attitude you can create great success and a tremendous amount of fulfillment. In her inspiring TEDX Talk, Muffy mentions that her life is different but no less because of her disability. We all have dreams for ourselves; we all struggle through challenges and difficult times. Yet with perseverance and a positive mindset, we can all accomplish great things. Sitting pool-side with Muffy, she told me about her proudest moment. She remembers, after winning her first gold medal, looking up and seeing her daughter, Elle, and knowing that she has been a positive role model. Muffy has shown Elle that against all odds you can accomplish whatever you believe is possible. Thank you Muffy Davis for the lessons and inspiration. I’ll be cheering you on at that Pan Am Games in Toronto next year. Contributed by Vanessa Judelman, President of Mosaic People Development, who has an impressive record of achievement as a certified coach working with executives and leaders at all levels. Noted as an expert in her industry, Vanessa strives for balance in her life, often achieved in a yoga class or by regaling her two young boys with childhood tales of her early years growing up in South Africa. This entry was posted in Inspirational, Mother, Women and tagged herstory, inspiration, Inspired by my mom, inspiring story, inspiring woman, London 2012, Mentor, Mother, Muffy Davis, Olympian, Paralympian, Vanessa Judelman. Bookmark the permalink.